At my daughters school they have a star of the day every day. My eldest daughter role plays this at home and a variety of her toys or the dogs get award the star of the day. Occasionally she gives it to her sister. She has had the star of the day 6 times so far, on the days when she doesn't get it the first words she says to me at pick up is 'I didn't get star of the day today' followed by a huge sigh. She came out all Skippy and happy today and was so pleased to show me her star of the day certificate. We had a very happy walk home. 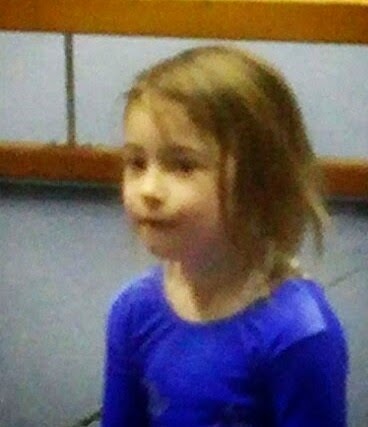 My daughters happiness continued into her gymnastics lesson. She attempted cart wheels and backwards rolls. I am noticing a real improvement today in her strength and ability. It would appear her teachers also have noticed an improvement as she was awarded her badge today. Apologies for the blurry photo, I had to crop out the other children from the image which resulted in a slight distortion.